There are several types of pain that are either exacerbated when sleeping in the wrong position, or are caused by bad support during the night. People with neck or back pain from an injury need to be very careful about the type of support they use in bed. The right pillow is very important to keep the neck and back in the right position while you sleep. Using the wrong pillow can even cause serious neck or back pain all on its own. The Mediflow Original Waterbase Pillow is a great support system that allows you to adjust it to the exact level of firmness, so that you can sleep soundly, feel great and wake up pain free no matter what position you prefer to sleep in. There are many neck support pillows available, but most are geared toward one or two particular sleeping positions. The way you sleep will have a profound effect on how you feel, and whether or not you end up with neck or back pain when you wake up. In order to achieve the best night’s sleep, you have to keep your neck in line with your spine, while at the same time, supporting your head. The Mediflow Waterbase Pillow has an inner water chamber that you fill to the desired level for precise comfort. That allows people who sleep on their sides to get the height they need to keep their heads level with their back, while stomach and back sleepers can lower the pillow height so their head isn’t pushed backwards or forwards out of line. Mediflow has been creating solid, firm, high-quality support pillows and using the best in sleep technology since 1994. That experience has become evident in the creation of their most advanced sleep aid, the Waterbase Pillow. This insightful sleep support gives consumers a pillow that is luxurious and extremely flexible. 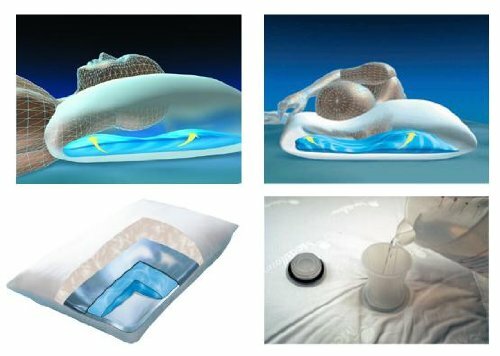 The Mediflow Waterbase Pillow was tested by Johns Hopkins University and ranked at the top of all 5 categories: Length of time to get to sleep, interruptions during sleep, time to get back to sleep, sleep quality and neck pain reduction. Other pillows can feel good at first, but end up losing their shape, support or comfort after a few hours. Then you have to wake up, fluff and reshape the pillow. You lose precious sleep and a lot of the time it never feels quite as good again. The Mediflow retains its shape all night long, and moves with your body as you switch positions. The Waterbase support takes the pressure off your head and neck, by distributing the weight of your body as you move. Inside the Mediflow Waterbase Pillow the water chamber is completely covered by a thick layer of 100% polyester filling. This gives the pillow a fluffy cushion for your head, while the water chamber offers flexible movement, support and adjustable height. The outer case is made of 100%, high-count cotton threading for a soft, smooth, hotel quality feel that stays cool and comfortable all night long. It is a large pillow with plenty of surface space to accommodate side sleepers who like to conform their pillows to their back or stomachs. It is also great for pregnant women who want added support for their stomachs that won’t be too bulky or create pressure when they move. The cover comes off to allow you easy access to the fill chamber to adjust the water levels. No chemicals are required to keep the water fresh. The tight seal on the water section allow you to keep the water in good condition for up to a year without refilling, and since no light can get in through the thick padding, no algae or other contaminants can form. The pillow case is easily washable for a clean, fresh surface whenever you need it. Just remove it and toss it in the washing machine and dryer. You can be assured of the finest quality from the Mediflow Original Waterbase Pillow. It is made with the best materials right here in the USA. The company has a stellar reputation for customer service and offers a firm, no questions asked guarantee for your satisfaction. Along with a good mattress, a supportive pillow that keeps you comfortable while making sure your spine is in the right position at all times is the best way to avoid injury pain that gets worse as you sleep, or pain caused by improper sleep positions. The Mediflow Waterbase Pillow is designed to support your head, neck and upper back to prevent strain and injury. More problems are caused when you move and change positions during the night on a standard pillow. The Mediflow Waterbase Pillow allows you to shift with ease and comfort, while keeping the spine supported and safe. There aren’t many, but if there were something to consider a downfall, the Mediflow Waterbase Pillow can be a little heavy when compared to common down or cotton filled pillows. Water weighs a lot, so it makes this pillow feel cumbersome at first. Once you get used to the feel and weight of it, however, it is no longer an issue, and the great support soon makes you forget about anything else. After buying pillow after pillow, finally, one that actually got rid of neck pain. Most comfortable pillow I have ever had. Enjoy waking up feeling refreshed and ready to greet the day pain free with the Mediflow Waterbase Pillow. This is a fantastic pillow that is modestly priced and will last for years. It has a great warranty and is easy to use. Filling is done directly from the sink and takes only minutes. Check out the Mediflow Original Waterbase Pillow today and never worry about neck or back pain again.